Beck has been promising since 2014 that his latest (then next) album Colors would feature "high-energy songs, designed for live shows," and boy if he didn't deliver on that promise. Tracks like "Wow" (which was accompanied some ridiculously psychedelic visuals) and title track "Colors" were downright uproarious. But those were only offered mid-set. He began his Toronto show with a slew of classics from his earlier albums, immediately whipping the crowd into a nostalgic frenzy. First on the list was "Devil's Haircut" from his 1996 record Odelay. It was an opener that not many expected, but one that was most definitely appreciated. He then followed it with his breakout single "Loser," which then ran into "The New Pollution." Up to this point Beck was still guitar-less, simply jumping around donned in one of his trademark hats. This was fairly short-lived though, as he cracked out his acoustic for "Mixed Bizness." From there on in his set was a perfect blend of intimacy and hype. 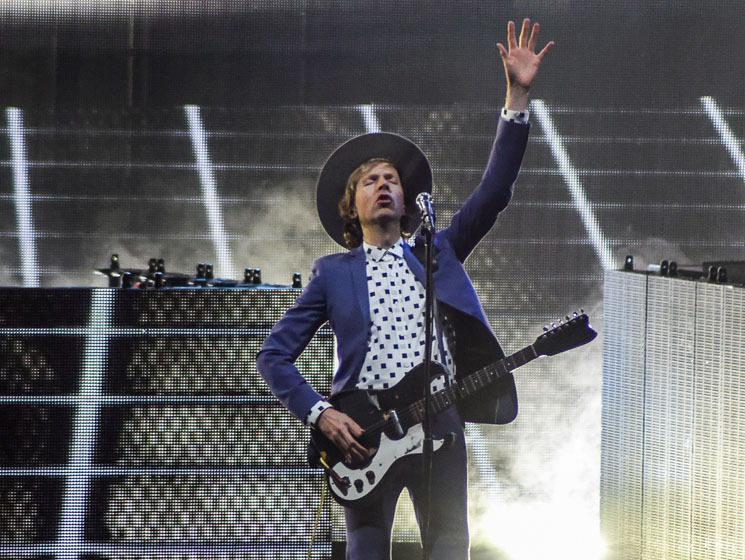 To accomplish this, Beck could have easily ran through a mix of his latest album, and his previous, award-winning record Morning Phase, but that wasn't to be case — this was a show packed with oldies and goldies. Surprisingly a lot of the highlights came from his divisive 2005 album Guero. "Go It Alone," "Earthquake Weather," and "E-Pro" proved to be some of the best tracks of the night. His covers of other artists' songs stuck out like a jazzy thumb; his slowed-down version of Prince's "Raspberry Beret" was one of most beautiful parts of the night. This was probably overshadowed, however, by perhaps the longest interlude of any live performance to date. Here, halfway through "Where It's At," Beck took some time to introduce the band and let each member bang out a 30-second jam of their choosing: the bassist treated us to a snippet of Chic's "Good Times," the keyboardist gave us a slice of "Takin' it to the Streets," by the Doobie Brothers, before the rest of the band dished out "Cars," by Gary Numan, "Once in a Lifetime," by Talking Heads, and a whirlwind of a solo by drummer Chris Coleman. At this point it was easy to forget that they were actually in the middle of a song, and though no one wanted the funky renditions to end, "Where It's At" had to kick back in some time, and kick it did. Just before that though there was a lovely moment when the whole crowd sang happy birthday to Beck (he was turning 48 at midnight). If his birthday wish was to put on a majestically memorable show, then he must have blown the candles just right, because that's exactly what he got.